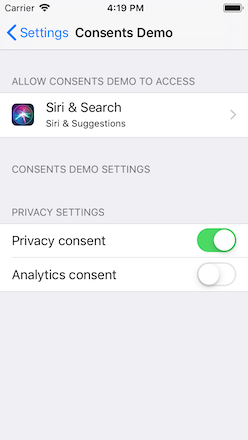 Want to be notified of new releases in smartlook/ios-consent-sdk? Since implementing the consent goes beyond core functionality and the intended design of the app, it is likely that this consent necessity will bring further annoyances, impact time and disrupt existing developing processes. So why not use or reuse some ready-made SDK? Generally, you want SmartlookConsentSDK.check() be called at the very beginning of the app life-cycle. Where exactly, it depends on your app architecture. If you don't want integrate this SDK into the standard app Settings, then viewDidLoad() of the root view controller is enough. If you want more comprehensive solution, then see our demo apps AppDelegate and ViewController for an inpiration.